NEW YORK, N.Y. – International Pharmaceutical Expo (INTERPHEX), sponsored by the Parenteral Drug Association (PDA), is the premier pharmaceutical and biopharmaceutical development and manufacturing event dedicated to innovation, technology and knowledge. 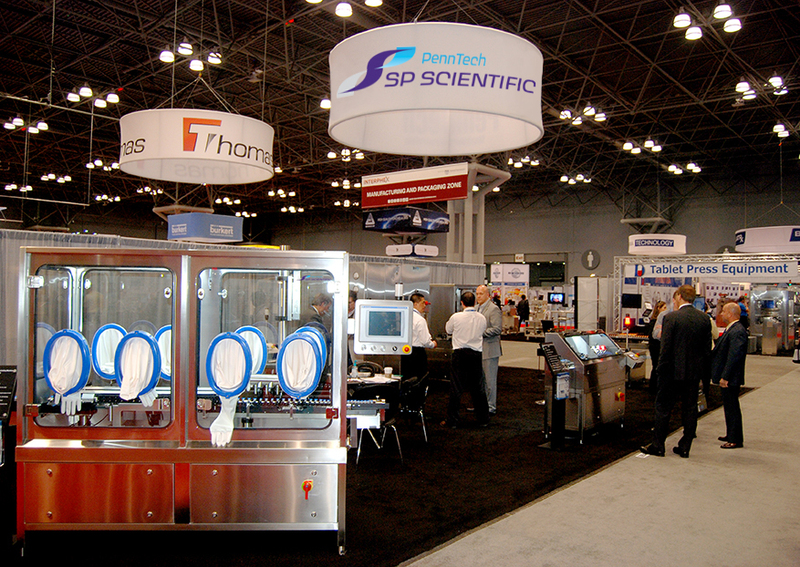 INTERPHEX has announced that SP Scientific’s PennTech, the only U.S. based manufacturer of complete aseptic vial processing lines, will launch new technologies at INTERPHEX 2015, April 21-23 held at the Javits Center in New York. 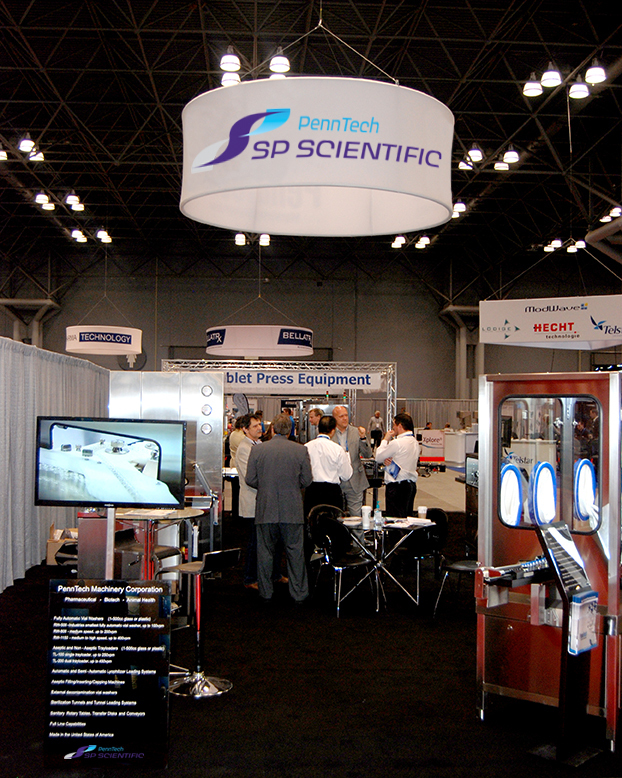 "SP Scientific’s PennTech will introduce a new vial filling/stoppering/capping machine, the FSC-1R at INTERPHEX 2015," said Vincent Smit, Director of Business Development of SP Scientific’s PennTech. "We are delighted to showcase our manufacturing solutions that focus on high quality and efficient design principles with a compact footprint. We invite everyone to stop by Booth #2954 and experience our innovation first-hand." 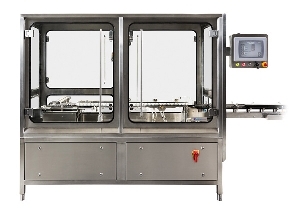 The new state-of-the-art aseptic filling machine, model FSC-1R, is designed for up to 30 vials per minute production with a compact rotary layout. 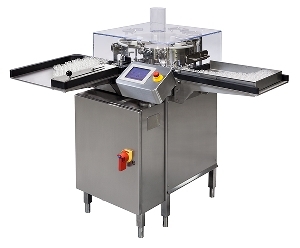 This machine can handle a wide vial range of 2-100ml with the latest in peristaltic pump filling technology using driven rollers with statistical or net weigh IPC options. The EVW-Series external decontamination machines are in-line decontamination systems that completely neutralize and wash vials while protecting the caps from moisture. This critical process protects the operators and general public from overexposure to harmful drugs and minimizes rejects during automated inspection. 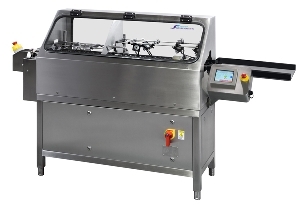 The EVW-60 is a new low-to-medium speed external decontamination machine designed to rinse pharmaceutical vials ranging from 2-100ml for rates up to 100 vials per minute. 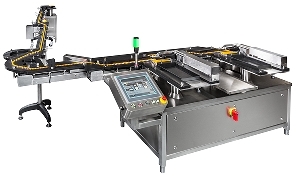 The machine measures 518x1270x1274mm (WxLxH) and can be used as a stand-alone unit with an infeed and outfeed turntable or integrated into a filling line. The EVW-100 is the industries’ only decontamination system to completely encapsulate the vial cap with a watertight seal as high-pressure water sprays the sides and base of the vial clean. 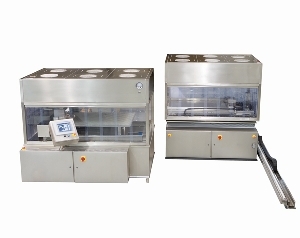 The cleaning process can be easily validated with repeatable recipe-driven washing and drying settings to accommodate containers from 2-500ml at rates up to 300 vials per minute. 13mm and 20mm caps can be processed on the machine without the need for changing parts. The tool-less changeover takes 5 minutes to exchange the infeed and outfeed timing screws. The piping for washing and drying, as well as the electrical control system, is housed in the base of the machine. 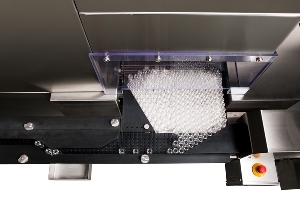 The RW-250 is a semi-automatic vial washer for low speed pharmaceutical and biotech applications. 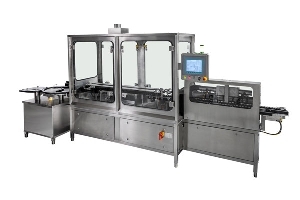 Throughput is typically 20-70 vials per minute. The typical batch size: 1,000-8,000 vials. Vial range 2-100ml glass or plastic (change parts required). The RW-250 includes 6 stations for water (RO/DI, WFI) and sterile air blowing. Optionally, for those using bagged WFI, a WFI skid with a 78 liter tank is available with a heating element, bringing the WFI up to 80°C. 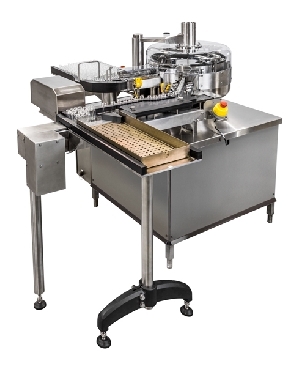 The skid includes a sanitary centrifugal pump, providing the vial washer with 73 psi (5 bar) water pressure. 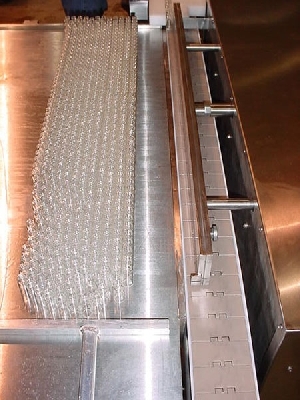 After cleaning, the vials are discharged onto a tray for further processing. The TL-100 is controlled by a Programmable Logic Controller (PLC) and handles plastic and glass vials. 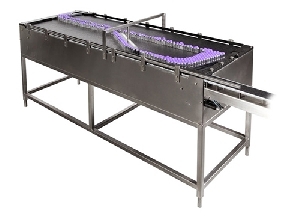 The unit is designed to handle trays up to 610mm (24") wide (open end) and up to 610mm (24") deep. Tray materials can be metal, cardboard, corrugated plastic, or rigid plastic. This unique tray loader is completely servo driven and requires no change parts. 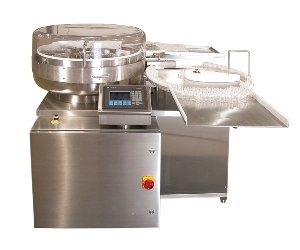 It is perfect for aseptic freeze-drying applications as well as packaging solutions. 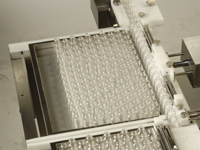 SP Scientific’s PennTech was founded in 1992 as a manufacturer of vial washing and trayloading machines. 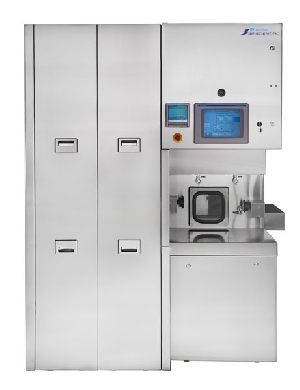 Since that time, success in performance and reliability has led to an ever increasing and diverse product line, to include: vial washers, trayloaders, sterilization tunnels, filling/stopper-inserting machines, automatic lyo loading machines, capping machines and external decontamination machines. Today, SP Scientific’s PennTech is the only company in the United States to manufacture complete aseptic vial processing lines. SP PennTech's specialty lies in low-to-medium speed application (sub 200vpm). However, they also offer many machines exceeding 400vpm. Special emphasis is put on simplistic, yet robust design, adherence to cGMP guidelines, and quality, not only of the machines, but also of the supporting validation documents. For more information, please visit http://www.penntech-corp.com.